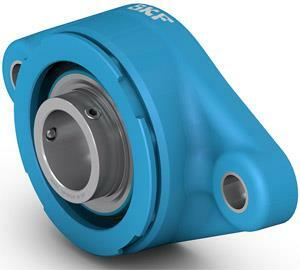 SKF recently launched a new line of ball bearings to improve hygiene, performance and compliance with food safety regulations. The Food Line ball bearings feature a hygienic design that incorporates a high-performing grease and a unique sealing system with complete sealability to reduce the risk of bacteria buildup in hard-to-clean areas and minimize the spread of bacteria during cleaning. The highly cleanable bearings do not require relubrication, which eliminates the cost of regreasing material and labor. Because there is no need to stop equipment for lubrication activities and less time is required for cleaning excess grease, the bearing units can also lead to increased production uptime. In addition, the Food Line ball bearings are engineered to last longer, which can reduce the cost and frequency of bearing replacements. "Traditional relubrication, wash-downs and dry cleaning of bearings can create hidden means by which contaminants thrive, such as airborne droplets, wastewater or contaminated grease," said Victoria van Camp, SKF's chief technology officer and president of innovation and business development. "Eliminating these food-safety threats requires a different approach to hygienic design, and that's what the Food Line ball bearings are designed to deliver."